I’d been living in England since I was 11, though I was born in Germany. In 1968, when I was 17, I travelled from London to Leeds to visit a friend of mine, Patricia, who had started architectural college. We went to this really glitzy discotheque, and we heard that a singer named Roy Orbison was going to come later. When Roy saw me he decided he wanted to meet me, so somebody came up and asked me if I would meet him. I ignored them, but then somebody else came to ask me, and I went to say hello. We started talking then, and for 20 years we never really stopped. That evening he had a really great suit on, and everything was very co-ordinated and stylish, but he also had a Levi’s jacket that just didn’t look right. I asked him about it and he said his manager had given it to him so he wouldn’t catch cold. Then he said: “If I promise to wear my best suit tomorrow night, will you join me for dinner?” I said yes and we arranged to meet, and that’s when we started seeing each other. We decided very early on that we wanted to be together. He asked me to marry him, and he also went to ask my parents. He was a gentleman. I was 17 and he was 32, but we had a lot in common. We were both avid readers; he was a student of history, and I love history. We both loved cars — when I married Roy he had 43 cars, and within a year I had seven cars. We had the same understanding of how God worked in our lives on a daily basis. He read the Bible every day, but he wasn’t a preacher: you could be with him for days and he would never tell you about his faith. He would say: “I have a gift, and it’s my voice.” He said he didn’t really like to travel, but he did it because if he went and sang, he could hopefully help one person out of the thousands who came to see him. Just him being in the room made the world a better place — he just had a light around him. Roy wore dark glasses because he’d left his ordinary glasses on a plane once, and went on stage in his prescription sunglasses — it became his look. He had his suits made by Dougie Millings in London, and his boots were from Anello & Davide. His English friends, like George Harrison and Jimmy Page, said he was the most English American they’d ever met. He loved Indian food, like vindaloo and samosas, and he had Indian restaurants he liked to go to in England. We lived in Hendersonville, by a lake, and our neighbours were Johnny Cash and his wife, June. When Roy and I had kids, Johnny and June were their godparents, and there was a real sense of community. 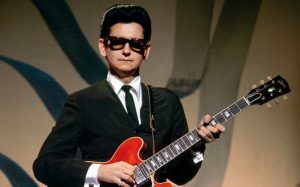 There would be about 7,000 people outside daily, between the Roy Orbison residence and the Johnny Cash residence, and Johnny and Roy would joke that when Johnny went out of the house he had to put his sunglasses on to avoid recognition, but Roy had to take his off! Roy had a great sense of humour. There would be a special room where he wrote songs — he’d say he was off to “compose… or decompose”. In 1988, Roy and I went to Paris, and I had this really strong feeling that somebody was going to die. I told him. I said: “God, it feels like someone really close to me. I wonder if it’s my mother or my father.” They were living separately in Germany, and I went to visit them while Roy went to Nashville. I talked to Roy on the telephone at my mother’s house. He said the Traveling Wilburys [the “supergroup” he formed with George Harrison, Bob Dylan, Tom Petty and Jeff Lynne] wanted him to go to England to make a video — but Roy and I had booked a holiday in Mexico. He said: “We’ll still go to Mexico. I’ll be there in three days, and one thing that’s certain is that when I get off that plane I’m going to see your smiling green eyes.” He said: “For that, I’d fly anywhere.” He said he’d talk to me in the morning. And about five hours later my mother woke me up and said Roy’s road manager, Terry, was on the telephone. He told me that Roy had died. I didn’t want to believe it. Share the post "THE REAL PRETTY WOMAN"